Most people don't like heart rate monitor chest straps. That's a fact. If you ask most runners, cyclists or even gym lovers, strapping on that uncomfortable elasticated strap and clipping on the transmitter is a pain. It's the main reason why heart rate monitor packing sports watches and headphones now exist - to deliver those bpm and heart rate zone readings in a much less intrusive way, whether that's from the ears or the wrist. But there's one big problem: Accuracy. We've been critical of the likes of Fitbit, Garmin and Polar over the reliability of the data delivered from the optical heart rate sensors packed into their wrist worn wearables. So what's the solution? Something that offers discreet monitoring combined with the accuracy you get from wearing a EKG/ECG chest strap. The answer could well lie with something like the CardioCycle SenseOn, a breath and heart rate fitness tracker that looks a bit like an oversized band aid. It sticks directly onto your skin using medical grade tape and captures the heart's electrical pulses in the same way that a medical EKG/ECG monitor can. Optical vs EKG/ECG: What's the difference? EKG/ECG heart rate monitoring: Electrocardiogram technology, detects the electrical activity produced by a heartbeat. It's still considered the most accurate way to record heart rate activity and is used by the medical industry and found inside heart rate monitor chest straps. Optical heart rate monitoring: This technology is used by companies including Fitbit, Garmin, Polar and Samsung. It involves using a method known as photoplethysmography (or PPG) where the lightwaves are sent into the skin using LED lights to detect blood flow. It can also deliver real time heart rate zone, resting heart rate and heart rate variability data to help you get the most from a workout and to also aid recovery. This super light tracker even packs an accelerometer to track running distance. Basically it packs a lot into a small body. Our eyes lit up when it landed in the office and it wasn't long before we were off finding out to see if this could really take the place of a heart rate chest strap for good. Firstly, it ticks that discreet tracking box, unless you work out with your top off. Even then, it's less than 100mm long and just 12mm thick. It's basically a little bigger than a finger. There's no display here, just a set of three colour LEDs that you can give a tap to ensure the SenseOn is synced to your phone. On the opposite of the rubbery, silicone body is the set of sensors surrounded by a velcro area that lets you attach a similarly shaped piece of adhesive tape to stick it to your chest. These adhesive strips are single use. A chest strap, however would probably last you a lifetime if you give it a good clean or rinse every now and then. The CardioCycle is bundled with 30 pieces of adhesive tape, so if you train regularly, that could see you through a month with no details on how much it's going to cost to replace them. The good news is that they stick onto the skin with ease and stay put most of the time. There were at least two occasions when the tracker began to peel away from the skin (check the image above) after a long sweaty run in the sun. It actually fell off before a race, but thankfully we were able to retrieve it. Once it's on though, you just don't notice it in the same way you do a chest strap. It's extremely light and doesn't cause any irritation against the skin. When it comes to pairing to a smartphone, things become problematic. 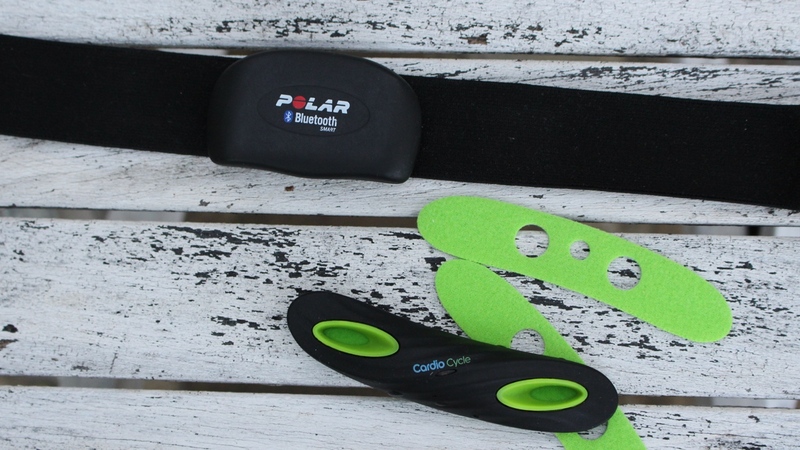 We've used Polar and Garmin heart rate monitor chest straps and can't think of a time when they didn't successfully sync with a running watch or a smartphone on the first or second attempt. We wish we could say the same about the SenseOn, but unfortunately that's not the case. Like a chest strap, there's no screen here, which means you're relying on the biometric data delivered to your phone. You can work out without your handset, but you'll need it nearby for viewing everything in real time. That data revolves around heart rate and breathing rate, similar metrics that are central to OmSignal's smart clothing range. So here's what really matters, the accuracy. Up against the Polar H7 heart rate monitor chest strap we were hoping for identical readings but that's not what we got. Still, they were close enough in the places where it mattered. In the sample run below, average heart readings showed a difference of 7bpm, while there was a 5bpm difference for maximum heart rate readings. When you look at the graphs, the dips and peaks appear in the session appear consistent. When a workout is done the SenseOn is not done yet. The last trick is the heart rate variability reading. We've spoken about the potential value of HRM tracking before and coupled with the breath monitoring sensors, the app will assess your current state before delivering you a verdict on your recovery rate. There's one last thing to address and that's battery life. With a chest strap, you're relying on the kind of coin cell battery that powers a watch to give you a year's worth of monitoring. The SenseOn promises to last two hours on a single charge. It lives up to that promise but a run can seriously dent the battery life by 20-25%. The bigger problem is that with no way of turning it off, you need to make sure you disconnect it from your phone or it's going to drain the tracker's power quickly without you knowing it. There's a battery charging case that goes from 0-100% in an hour, and you definitely need to keep it nearby at all times. So after a couple of weeks of ditching the chest strap, is it time to do it on a more permanent basis? The simple answer is no. A heart rate sensing band aid certainly addresses the biggest issue with wearing a monitor around your chest. It also delivers reliable data as we'd anticipated. Our concerns lie with the sticky nature of the design. We were left unconvinced by those instances when it began to peel away from the skin. Stocking up on adhesive strips every month sounds also like a hassle we could do without. There's definitely some pairing issues to address as well. While we're not ready to banish the SenseOn to the bad ideas bin just yet, it still has some work to do to convince us that it's ready for big time heart rate tracking.